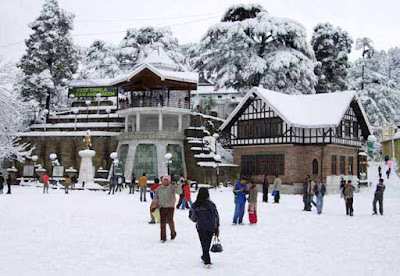 Shimla (Vijyender Sharma): The State Capital of Himachal Pardesh, Shimla, that was once known as the Queen of Hills, is plagued by water scarcity, traffic chaos and haphazard construction. Driving in the city is nothing short of a nightmare and tests your patience. Pleasant weather, however, remains one of its prime attractions. Umesh Ghrera, a journalist who was brought up in Shimla, described the problems of the hill destination, known for wooded deodars and Raj-style structures. Ghrera, who was holidaying with his family here, said the biggest issue in Shimla was the limited space for parking. "You may be willing to shell out hundreds of rupees but may still not find parking space. It's high time the government took some drastic steps to improve the situation. Or else Shimla will not be worth living in," Ghrera told. He said he was charged Rs.100 for an extra bucket of water provided by his hotel. Locals say Shimla faces water scarcity in both summer and winter. Even the water supplied is less than the prescribed limit of 135 litres per capita per day, it said. From 2009-14, the corporation had supplied 110 litres per capita per day. Official sources said the normal demand of the city is 42 million litres daily but the availability ranged from 35-37 million litres. Stokes told that detailed project reports for a water supply scheme to Shimla from the Kol Dam near Tatapani, rehabilitation of water supply distribution system and rejuvenation of sewerage network, totalling Rs.643.05 crore had got technical clearance from the central government.Planned for a maximum population of 16,000 during the British Raj, Shimla is now home to 170,000 people. According to tourism industry representatives, Shimla gets 20,000-30,000 tourists on an average every weekend during the peak season -- from May to June and November to January.Urban Development Minister Sudhir Sharma said to check traffic jams, the department was constructing a 3.5 km ropeway, the first major ropeway project in the state capital. Chief Minister Virbhadra Singh laid the foundation stone of the Rs 200-crore ropeway project recently that will link the new bus stand with Jodha Niwas above the Mall road. The agreement between the government and the company was signed on the built-operate-and-transfer basis for 40 years.Himachal Pradesh's economy is highly dependent on tourism, besides hydroelectric power and horticulture.